Looks Good from the Back: Beauty Stuff Talk. Some More. A: So, you know how I was all down on highlighting concealer pens? M: Oh I like where this is going. A: I believe I called it, "the obnoxious milquetoast friend of concealer." A: So, um, I bought one I kind of don't completely hate. It's the Maybelline Dream Lumi Touch pen in Radiant. M: HaHA. Is it just a glowy-maker or does it actually conceal...things? A: It's glowy and PINK so it works more as a corrector on me. Don't worry, I still have to layer two other concealers over it, but it helps quite a bit. And I can't believe I just said that. M: Two layers OVER it? Sheesh. I've been using that Hard Candy Glamoflauge that one of our readers recommended it and I like it with reservations. A: I go kind of insane with the concealer. I correct with the Lumi pen, then a little Benefit Fakeup, then I hit up the darkest part with the Nars stuff. It's strategic. Tell me more about this Glamoflauge, pls. M: Whatever works! The Glamoflauge (which I always misspell and that is a stupid name anyway), is pretty good. The TINIEST amount (like pinhead sized) covers the entire under eye area. It brightens and has good coverage, but it creases. I have found that patting the area with my ring finger about 10-15 minutes after applying helps smooth it all back out though. Sometimes I put a little CANMAKE Cover & Stretch Concealer on the very dark bit though. I told you about the Canmake, right? A: NO YOU DID NOT. A: Oh right! You did show me that. How do you like the concealer? 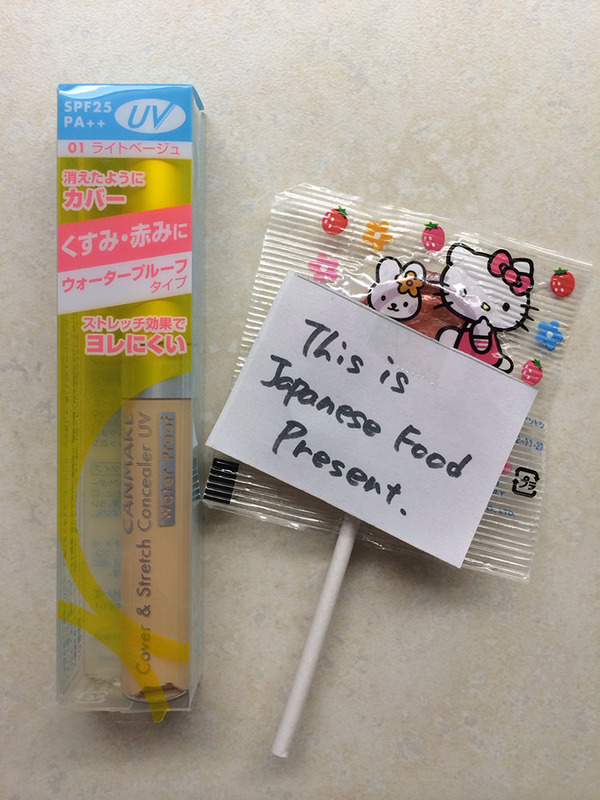 And the food present? M: Lu claimed the food present as her own, declared it delicious. The concealer is interesting. It purports to have "stretch" and it kind of seems to? Unfortunately I find it way too drying to use under my whole eye. It is better for spots and red marks. But still, I like the little doe foot applicator and it was not expensive. A: Interesting! And oh my god I swear I have other conversation. 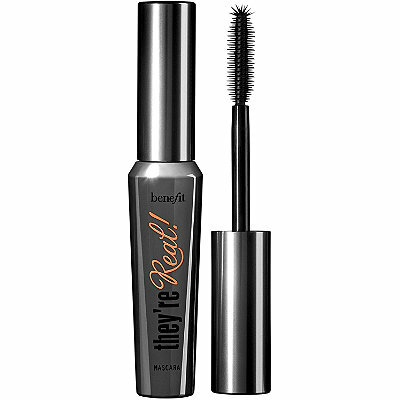 I've been using a sample-size of Benefit They're Real mascara and I like it a LOT which makes me mad. M: Ugh, you know how I feel about expensive mascara! I just had to throw ALL of mine away because of pinkeye and man I was glad it was all from the drugstore. A: I KNOW. I feel the same way, that's why it makes me mad that I like it so much. 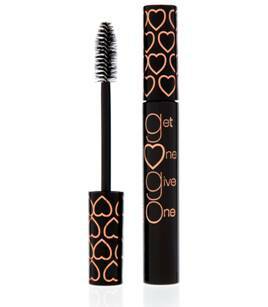 Its very black and stays on all day and makes my lashes look significant. It was free but I know I'm going to be sad when it's gone. Maybelline The Colossal 4VR. M: I have tried a few samples during the scourge of pinkeye (in both eyes! ), and I will say the Josie Maran mascara doesn't irritate at all. Sadly it also doesn't really DO much. It darkens my lashes and doesn't clump at all, but it's waaaay more natural than I usually go for. However, if you want a natural look and/or have very sensitive eyes, two thumbs up. A: Yeah, I don't do natural when it comes to mascara either, but that's good to know! Your poor eyes. M: They are 98% back to normal so I picked up some new drugstore mascara. I went with the Clump Crusher Extensions because why not. M: I haven't tried it yet. Derp derp. M: But I HAVE been using those Unwrinkle peel pads you love so much and I am a very big fan! And the DHC cleansing oil! Tell me more things to buy because I am very impressionable! A: StriVectin-SD. Lara was right, this is good stuff. A: I've been using the stupid tiniest tube for the past two weeks and my skin is smoother and less wrankled. We're not at amazing yet, but definitely better. A: Perhaps you'd like to hear more about my 12 step face-washing method? 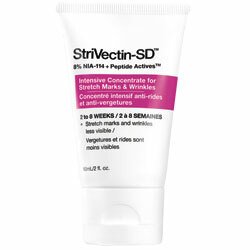 I love Strivectin so much! I went to the optometrist a few months after I started using it (thanks, Birchbox!) and she said my eyes were filled with mucus-covered dust and asked if I was using any different products. I was like--yeah, but I'm not giving up my Strivectin for my eyesight! What?? Why is it in your eyes? I dunno, but that's the only thing I was using that was different. I get crazy with the Strivectin, baybeee! Oooh yay!!! I love hearing I'm right! Haha! Well, i'm just so pleased it's working for you! TJMaxx/Marshalls has a ton of Strvectin stuff right now because they just redesigned their packaging again. I'm still swearing by the combo of SD with the H2O hydrating treatment. Seriously almost wrankle free! I keep forgetting to check TJMaxx and Marshalls! Wrankle Free for you and me! I have to say I got the sample of They're Real, too, and found it all under my eyes in NO TIME, which made me angry. But! Loving the unwrinkle pads I bought at your reco, so thank you for that! I haven't had that issue, amazingly. Glad you like the peel pads! Mine's a mini size so the brush is too short, but I think you're right. The little end-spikes are the key. I bought The Colossal based on your recommendation and its GREAT. If you want to keep going down the highlighter pen-path, try Givenchy Mister Light (I'm super pale and the #4 color works on me). I got hooked on a Sephora sample and it's stupid expensive, but I like it. I'm probably going to buy a full size of the Dior Hydra Life BB cream, too, which gives similar glowy results for the whole face. Have either of you tried it? I actually have a sample of the Dior Hydra Life BB cream that I've been meaning to try. I'm a little afraid I'll like it too much. Here's your happy medium - the Body Shop does a GREAT YSL Touche Eclat dupe- I use it whereever there is a shadow, and it's beautiful. Silky texture, doesn't start sticking in creases or showing in patches- it just does what it's supposed to do. You'll def. need a "real" concealer over it, but this makes you need much less because it takes care of dark bits and shadows. Nice, thanks for the recs! I have had found some excellent makeup at the Body Shop!! I use their powder foundation during the warmer months and love how well the shade matches, and doesn't go on cakey or heavy! Also, they make some gorgeous shades of eyeshadow and pretty nice brushes too! Also, MAC does a brightening concealer pen for around $18 that is amazing! I think it's from their Prep and Prime line?